Baby girls white embroidered lace large bow dress & bonnet, the perfect christening dress for a baby girl but also suitable for all special occasions including wedding wear as a baby flower girl. 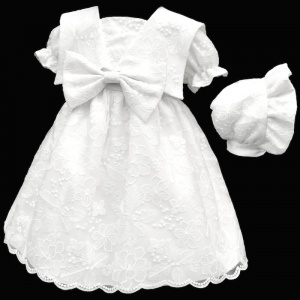 Dress: Elegant white fully lined short sleeved dress with an overlay of all over embroidered lace. Deep sailor style collar with a large bow to the centre. 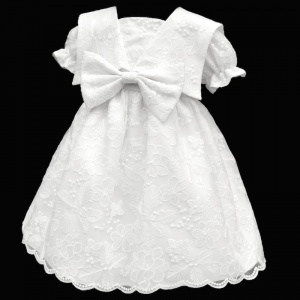 A white satin ribbon which beautifully ties at the back with a button fastening. Fully lined with underlay netting to create fullness, with a frill to the hemline. 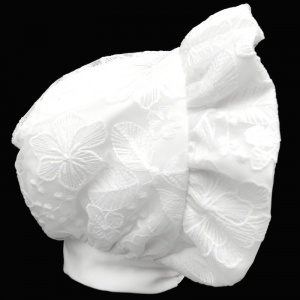 Bennet: Matching white bonnet with an all over embroidered lace design, with a frilly peak and satin ribbon tie, completing this elegant design.